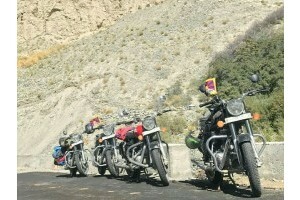 Tawang Motorcycle Tour is one of the most exciting tours that anyone can think of. We shall go beyond driving the bikes. We shall ride over highway, mountains, off roads, rocks and ice (not snow). While the ride shall be tough, we shall be backed up with experienced ride captain, all-rounder mechanic with his tools and spares ready and a backup vehicle with medical and emergency support. While we shall ride on the daytime, we have planned to spend our nights differently in tents, with local wines, foods, music and dance (Wherever possible). Any cost arising due to natural calamities like landslide, heavy snowfall or strikes will be borne by the client and will be payable on the spot. The Staple food of Arunachal Pradesh is Rice. So, expect rice in your meal. A list of things to carry will be sent to you after the completion of your booking. Upgradation of bike or single sharing accommodation is available on additional charge. The tour can be cancelled or delay before the commencement, in the case minimum participation is not attained. In such a case we shall inform you immediately and also return the total amount collected from you. Accommodation on twin sharing basis in Hotel/Tent. Single seat in a Traveller or SUV. Day 1: Arrival at Guwahati: On your arrival at Guwahati, proceed towards your hotel. Our team will be there to welcome you. Get freshen up and gather for the briefing. Our ride captain will be briefing you about the route you would be riding for the next 7 days. Along with that we would be discussing the challenges, dos and don’ts and other safety measures. You will be receiving your bikes today. Take out your bikes for a small ride across Guwahati to get used to it. If you need any changes in your bike, our tour mechanics shall be on the job. You will also get the time to get accused with your fellow riders who will be your riding buddies for the next 7 days and for lifetime. Day 2: Guwahati to Nameri (224 kms): We would be flagging off our tour today at 9 AM sharp after breakfast. We would be riding till Nameri today which is 224 kms. Enjoy the greenery on the way as you will cruise through a very smooth highway. Overnight stay at Nameri Eco Park. Day 3: Nameri to Dirang (165 kms): On day 3, we would be riding till Dirang which is 165 kms from Nameri. Say hello to curvy roads and beautiful mountains. We would be staying in camps today alongside river Kameng surrounded by the beautiful hills. Enjoy the bonfire with local cultural show and have fun as the local drink called ARA will be on us. Cheers!! 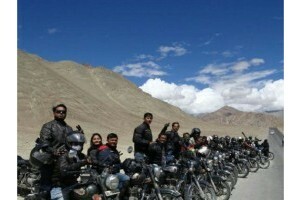 Day 4: Dirang to Tawang (135 kms): We would be riding towards Tawang today after breakfast which is 135 kms from Dirang. Pay homage to Jaswantgarh War Memorial and make a halt at Sela Pass, which is located at 13,700ft above the sea level. Enjoy the beautiful landscapes; snow filled mountains and foggy roads along the way. Check-in to your hotels after reaching Tawang and get refreshed. We would be arranging an evening tea/coffee for you Café’ Suburb where a local Lama will tell you about the history and significance of Tawang. We would be discussing the next day ride which will be the most adventurous ride to Bum La pass after dinner. Day 5: Tawang-Bum La Pass-Tawang (Overall 100kms): On day 5, we would be riding towards the most adventurous and beautiful Bum La Pass which is located at Indo-China border at 16,500 ft above the sea level. This place will be mostly covered with snow. Bum La is the place where one of the fiercest battles took place in the 1962 Sino-Indian war. On the way, enjoy beautiful lakes such as Heart Lake, P.T. Tso, and Sangetsur Lake. Check-in to your hotel after reaching Tawang. Evening time free for shopping and exploring the beautiful markets of Tawang. 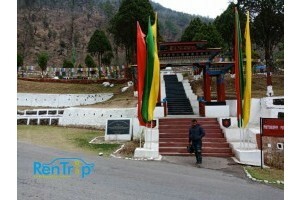 Day 6: Tawang Local Sightseeing: On 6th day, we would be exploring in and around places of Tawang after breakfast. Twang is full of beautiful monasteries. We would be visiting Tawang Monastery which is the largest monastery in India and the second largest in the world. We would be then visiting Urgelling Monastery which is the birthplace of the 6th Dalai Lama (born Tsangyang Gyatso). We would be then heading towards Chakzam village for a short adventure ride where you would find a hanging bridge which was hand- made 560 years before with iron wires. We can also watch and sound show in the evening at the War Memorial of Tawang. Check-in to your hotels after a day full of adventure. 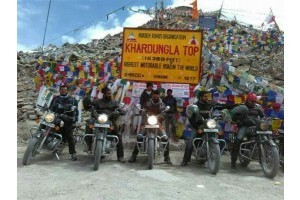 Day 7: Tawang to Dirang (135 kms): We would be the beautiful Tawang today and would ride downhill towards Dirang. We would be visiting Jung waterfall which is 100 meters high, Apple and Kiwi Gardens and Kameng River on the way back to Dirang. Overnight stay in tents alongside Kameng River. Local drinks and bonfire will be arranged in the night. Day 8: Dirang to Guwahati (380kms): On the final day of the tour, we would be riding back from where we have started. We would be reaching Guwahati after riding 380 kms which will include both mountains and plain roads. Check-in to your hotel rooms after reaching Guwahati. Get freshen up and gather for the tour completion ceremony where all of us would be sharing our experiences. Rentrip T-shirts and certificates will be provided to all the participants. We have seen a dream before the starting of this trip and we have lived it now. Say goodbye to your fellow riders with a promise to meet again for another amazing ride.